Investigators executed a search warrant yesterday afternoon in the 100 block of Radford Circle in reference to an Identity Theft investigation that began in May. Investigators have arrested and charged 40 year old Malika Shanta Oliver, of Radford Circle, with Trafficking in Stolen Identities. The investigation, which is in its early stages, has revealed that Oliver was working with a company by the name of MedAssist which specializes in assisting medical patients with insurance eligibility. MedAssist had a contract with the Southeast Alabama Medical Center until January 2017. As part of her employment, Oliver had access to a large volume of patient demographics. Investigators have recovered evidence that Oliver was illegally using patient information to open multiple lines of credit. At this time we have identified multiple victims from the evidence recovered. Every person that we know has been compromised will be contacted by an Investigator. Anyone that believes they may be a victim of this data breach is strongly encouraged to obtain a credit report to ensure their information has not been used. The Southeast Alabama Medical Center is fully cooperating with the investigation. Oliver will be transferred to the Houston County Jail and bond will be set at a later today. All persons arrested are innocent until proven guilty in a court of law. On 06/27/2017 Investigators arrested and charged 33 year old Chiron Danile Strain, of Willie Varnum Road, with Torture, Willful Abuse of a Child under 18 years of Age. Due to the sensitive nature of this case no other details can be released. Bond has been set at $250,000. All persons arrested are innocent until proven guilty in a court of law. On 06/26/2017 Officers responded to an armed robbery that occurred in the 3300 block of South Oates Street. The victim’s car was taken in the commission of the robbery. Units immediately began searching for the stolen vehicle. Yesterday afternoon Investigators identified the suspect as 44 year old Roger Dale Hall, of N. Oates Street. Investigators obtained a warrant for Robbery 1st degree and began actively searching for him. Hall is also wanted on escape related charges from the Houston County Community Corrections. Last night the stolen vehicle was involved in a single vehicle accident in the Fadette Community. A white male matching Hall’s description was seen fleeing into the woods following the accident. Geneva County Sheriff’s Office, Slocomb PD, Houston County Sheriff’s Office, Dale County Sheriff’s Office, and Dothan PD Officers searched the wooded area with assistance from the Dale County Aviation Unit. The subject was not located. Investigators recovered the stolen vehicle and it will be processed today by Dothan PD. Anyone with information on the whereabouts of Hall is urged to contact your nearest law enforcement agency or CrimeStoppers where your identity will be protected. The Dothan Police Department is seeking the help of our local and surrounding communities in identifying the woman shown in the pictures below. She is wanted for questioning in regards to a theft case. Police are asking anyone with information regarding the identity to call the Dothan Police Department 334-615-3000. Community members wanting to assist anonymously can call the Crime Stoppers Tip Line at (334) 793-7000. 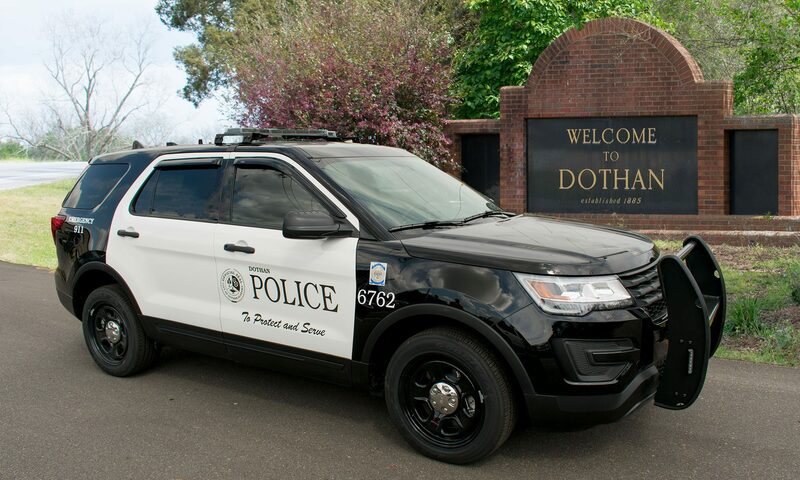 The Dothan Police Department will stringently guard and protect the identities of all those who wish to help in an anonymous capacity. On 06/26/2017 Investigators arrested and charged 21 year old Shaquon Akille Ledbetter, of Tyson Road Clayton, and 20 year old Christopher Marquist Denkins, of Springview Dr. Columbia, with Burglary 3rd degree. This was in connection with a residential burglary that occurred in the 200 block of Mona Drive. Bond has been set at $2,500. On 06/26/2017 Investigators arrested and charged 27 year old Kayla Deandra Singletary, of Vassar Street, with Domestic Violence 2nd degree. Bond has been set at $10,000. Please come and join us for the Junior Police Academy Graduation this Friday! On 06/26/2017 Investigators arrested and charged 23 year old Travis Gore, of E. Lafayette Street, with Discharging a Firearm into an Occupied Building. Bond has been set at $5,000. On 06/25/2017 Investigators arrested and charged 18 year old James Morris Johnson III, of Mustang Drive, with Domestic Violence 3rd degree and Receiving Stolen Property 3rd degree. Morris was found in possession of a stolen firearm following a domestic altercation that occurred on S. College Street. Bond has been set at $16,000. On 06/24/2017 Investigators arrested and charged 31 year old Bryan Anthony Taylor Jr., of Fairfield Drive Huntsville Al, with Burglary 3rd degree. This is in connection with a commercial burglary that occurred in the 4100 block of W. Main Street. Bond will be set at a later time. All persons arrested are innocent until proven guilty in a court of law.